6.25 points at 16 votes (rank 579). 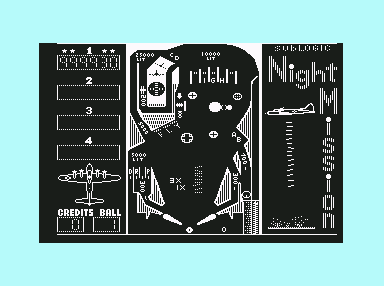 Night Mission is a pinball simulation for one to four players and can be played with keyboard or joystick. 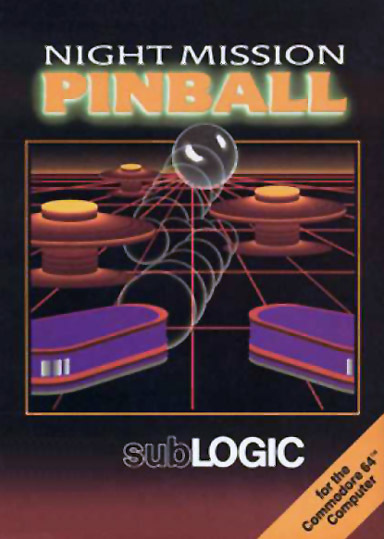 The game was published by Sublogic and developed by one of the owners Bruce A. Artwick. It was the answer to the successful "Raster Blaster". 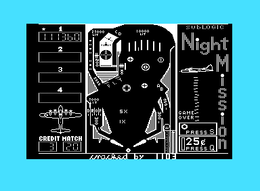 Night Mission‘s topic is airplanes. This topic probably stems from other Sublogic successes, as they became famous with their flight simulator Flight Simulator II. Utterly interesting is the "FIX mode" where one can set 38 different variables and physical parameters of this pinball simulation as number of balls, the inclination of the table or the bumper impulse. Clear design of the pinball table in Hires mode with good sequences and bonuses. Adjustable colours. In the initial settings very realistic behaviour of the ball. The highlight is the FIC mode in which one can adjust numerous variables and physical parameters. Q = throw in coin. Press this key several times to raise the credits (4 coins = 4 games for 1 player or 1 game for players). P = pause game. Continue by pressing pause again. Dive Bomb: Inner Spinner = 200 & lights City Lites (100 points per light). Multi-Ball play: if NIGHT sequence and FLY sequence are complete, the gate for the ball chamber is activated. A ball that gets into the chute is kept in the chamber and a new ball is launched. ABCD, a lost ball or balls in the chamber free all balls. General Stars: There is a star every 1.000.000 points. The start appear above the score number of the corresponding player. The joystick buttons can be used for moving the flippers. Push the right joystick forward and back to control the striker. FIX mode: press the keys F I X to get to this mode. Here you can change 38 game variables by entering new vales followed by RETURN . Press the CLR key to leave this mode. 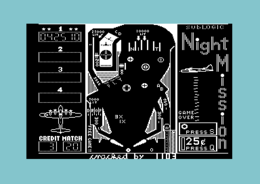 Highscore: Insert a formatted disk and press CTRL + R to load the current mode and the highscore list or CTRL + W to save them. CAUTION: The disk is deleted before the score and mode will be saved!! Just experiment with the different values. Colour changes apply to the text and the graphics. If the text disappears, press the key F5 to get some contrast back. An important trick: stretch the strikerl fully with the key "F7". Then loosen it a bit by using key F1”. Now shoot the ball with the "Commodore" key. By the right tension of the spring the ball first goes through the chamber. This has the effect, that the D-Lan Gate at the lower left and the ball cannot get lost that way. 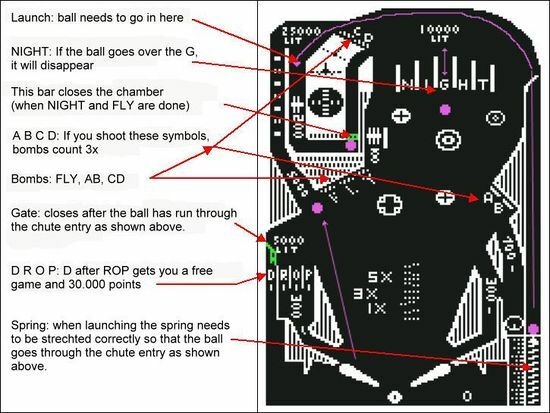 Now it is important to erase the letters N I G H T. If you then shoot the 3 fields at FLY, the bar for the chamber outlet gets closed. If you are lucky now and make it to shoot the ball into the chamber it will stay there. Now you can shoot a new ball into the chamber and then a third one. With the 4th ball the gate open. Then you play with 4 balls. Bombs: If you hit the fields at A, B, C, D or F L Y you get one bomb. This gets you additional 1.000 points. If you make it to shoot all fields A, B, C, D the bombs count each 3x, 3.000 points. If you do that again you get 5x the points, 5.000 points per bomb. The fields at A, B, C, D are acitivated anew if you shoot into the Chute Entry. Shakermaker303: "Not a bad pinball with many features. The handling is quite nice,optically it is not my thing, but ok – it is from 1983. But all in all it is well playable, one should at least have tested it." Camailleon: "My favourite pinball on the C64. The design and also the sound make it next to the game itself lots of fun to play. It is also interesting to play around with the many settings. 9 points from me." blubarju: "This is also my personal favourite belowthe pinball simulations. Good handling and many targets. 8 points from me."